As early as 1827, surgeon Peter Cunningham’s book ‘Two Years In New South Wales’ mentioned that ‘Australian perch’ (Australian bass) could be caught on flies. So could mullet and small Australian grayling, though fly fishing for them in NSW was not described in print until a London magazine article of 1864. 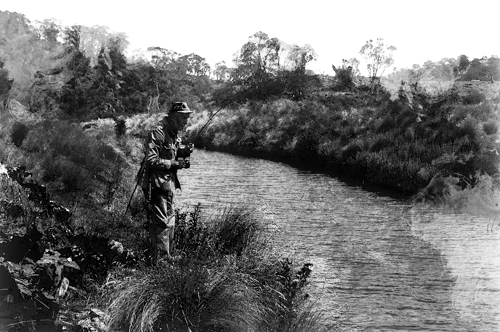 In 1868 the Sydney Morning Herald reported fly fishing for bass on the Hunter and upper Nepean Rivers. Howard Joseland’s ‘Angling in Australia and Elsewhere’ (1921) described and illustrated the first known Australian trout fly patterns. It also gave detailed information on fly fishing for native freshwater species including bass and estuary perch, and in inland waters, Macquarie perch, golden perch, Murray cod and trout cod. In the late 20th century, advances in breeding and stocking—and developments in fishing technology—brought renewed interest in fly fishing for some of these species. The long NSW coastline, with its many inlets, also provides rich opportunities for saltwater fly fishing. Despite this diversity, the sport has remained strongly focussed on trout since the early years of the 20th century. Trout may have been first introduced to NSW in the Hunter area around 1871. During the 1880s and 1890s they were introduced to the Monaro district in the south, the area around Oberon and Lithgow, and the New England tableland in the north. By 1905 the Snowy Mountains streams provided spectacular fishing for rainbow trout. These areas remain the heart of NSW freshwater fly fishing.